Jochen Hemmleb: Was Andrew Irvine Found in 1960? 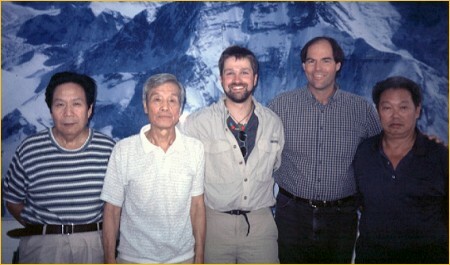 Nearly three months after the second Mallory & Irvine Research Expedition, in August 2001, expedition leader Eric Simonson and myself travelled to Beijing to interview members of the Chinese Everest expeditions of the 1960s and 19790s. We first met Wang Fuzhou and Qu Yinhua, two participants of the long disputed ascent in 1960, and deputy expedition leader at the time, Xu Jing. During the interview with Xu Jing, he talked about the preparations and logistics of the 1960 expedition, as well as routes and camp locations. Simonson then turned the subject to possible traces the Chinese had found of earlier attempts, especially of the 1924 Mallory and Irvine climb. "At about 8,100 meters... to the left... he found this yellow tent, fixed by rope, from England." From its altitude and position, this could have been the 1924 Camp VI, Mallory and Irvine's last camp, which our 2001 expedition thought to have revisited for the first time since the Second World War. "There is a body, 8,200 meters high, one body…in a sleeping bag. That person is frozen there." Simonson looked at me in disbelief. "Did he say he found a body"? He asked again. "At 8,200 meters?" "He thinks, maybe it is at 8,200 meters or 8,300 meters, between that area." -which would have been 26,900 to 27,230 feet. To make sure we hadn't misunderstood, I asked once more. "A body?" We showed Xu a photograph of Everest's North Face, on which the various camps and Mallory's resting place were marked. Xu estimated that the body he had found was some 330 yards or two hours away from their Camp VII - definitely above Mallory. As only two climbers had been missing around this altitude on Everest prior to 1960 - Mallory and Irvine  the conclusion was obvious: Xu had found Irvine in 1960. Xu repeated his story one and a half years later in an interview with the British newspaper, Sunday Times (April 27, 2003). In the interview he revealed further details: He had found the body during the descent from Camp VII, on the day his colleagues attempted the summit (May 24, 1960). It was face-up in a narrow gully at 27,300 ft. The body was intact, but its skin was blackened. A sleeping bag around the body, as Xu mentioned again, still seems unlikely. Mallory and Irvine in all probability would not have taken a sleeping bag on their summit attempt due to weight reasons. But it seems possible that Xu had confused shredded, multi-layered clothing with the remnants of a sleeping bag. "After I returned, I did some research of the historical records and realised it must have been Irvine."